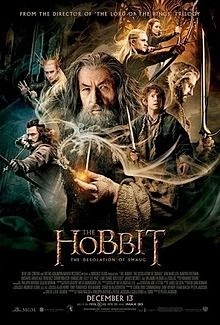 Just to get in a quick movie review before I forget it: over the Christmas break I took the bullet for the family and took the Weedlets (minus Eldest Weed, who has developed taste) and the little cousins to the second installment of The Hobbit. Qua movie, I enjoyed it more than the first installment simply because Jackson didn't use whatever camera trick he used the first time that made all the makeup so obvious that everything looked cartoonish. I could stand to look at it. However, qua Hobbit, it's awful. Jackson has no interest in the charming story that is The Hobbit. It's clear he thinks of this project as Lord of the Rings prequels, and he spends all his story-telling energy on that, to the point of making up characters and story lines. It's like LOTR fan fiction. Middle Weed summed it up: "As an action movie, I give it a B. But it had nothing to do with The Hobbit."